The two-story 1908 house in the Boylan Heights neighborhood of Raleigh, North Carolina, looks like many of the homes in this historic district -- green lawn, commodious front porch, fresh paint. But the young entrepreneurs who live and work here have hopes for more than just a beautiful space. They want to help change the way businesses are developed and launched. This is ThinkHouse, home to a nine-month residential program designed to provide emerging entrepreneurs with the support they need to turn their ideas into new businesses. A recent Forbes article places the failure rate for startups at a dismal 80 to 90 percent -- not exactly incentive for young entrepreneurs to give their dreams a go. But by providing recent university graduates the environment, networking opportunities and skills to launch scalable companies, ThinkHouse is out to prove that with proper support, more entrepreneurs will succeed. Who might you bring into your creative process to strengthen ideas, implementation and evaluation? While the long-term impact remains to be seen, the short-term return on investment is encouraging. It started the way ideas often do -- in a conversation among friends. Co-founders Jason Widen, Brooks Bell, Christopher Gergen and Jesse Lipson (all successful Research Triangle-area entrepreneurs) previously collaborated on HQ Raleigh, a local entrepreneurial workspace. That endeavor proved pivotal in providing businesses the physical space in which to cultivate their ideas and grow their companies. But missing were the educational, mentoring and collaborative aspects vital to lasting success. The four began brainstorming and came up with the co-working, co-living, fellowship program. They bought the 3,500-square-foot house and, in fall 2013, launched ThinkHouse. The goal is to help recent university graduates turn their ideas into viable businesses that can grow and earn money while at the same time creating comprehensive entrepreneurial life plans with the help of accountability partners. 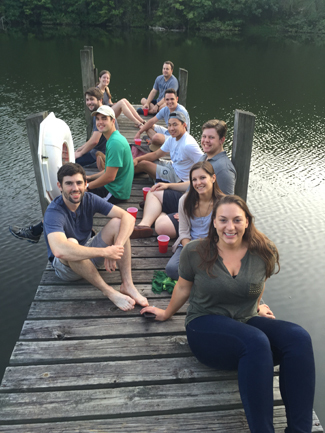 Fellows and staff relax at the ThinkHouse kickoff retreat. From August through May, the seven to 10 annual fellows build a network of connections with media, investors and potential business partners throughout the local Triangle area and the nation. So far, 13 companies have been launched; 10 more are expected from this year's fellows. Fellows participate in monthly meetings with a peer advisory board, receive leadership training and development (which includes a weekend retreat), and have access to the resources offered at the Triangle’s three major universities, as well as HQ Raleigh. ThinkHouse alum Sean Newman Maroni, the CEO of the innovation consulting firm Betaversity, says he gained a “more realistic definition of entrepreneurship” than he had been exposed to prior to his time in the house. “I was spending my time on the Internet absorbing inspirational keynote speeches and books written by CEOs that built ‘unicorns’ -- companies that achieve billion-dollar valuations in mere months,” he said. With Betaversity, Maroni focused on building a resilient, profitable business that will create sustained value over the long term. “ThinkHouse showed me the benefits and tactics of building a business in this manner,” he said. Through ThinkHouse, Maroni was able to define the Betaversity mission clearly -- and find talent to help him go from inception to success. “We actually pivoted our business into an entirely new area. We entered the program as a consultancy and left it as a mobile-lab-facility manufacturing and logistics company,” he said. Community outreach is also a part of the program, which has helped to establish good relations with the neighbors. Since ThinkHouse sits in a quiet residential neighborhood, its founders were careful to introduce the 20-something fellows and assure the curious and perhaps wary neighbors that the two-story former group home would not turn into a rowdy frat house. For starters, the new owners turned the old, dilapidated dwelling into a beautifully remodeled home. The result is a space that invites conversation and collaboration. From the open kitchen with its farmhouse-style table (which doubles as a conference table) to the common areas furnished with couches, modular seating and workstations, the environment itself is a natural incubator for creative cooperation. For the 2015-16 session, fellows pay $600 per month, which includes rent, or $300 for the program alone (for the four fellows who live off-site). Is this kind of outreach an intentional part of your work? ThinkHouse also regularly hosts local leaders for neighborhood meet-and-greet events, which has helped strengthen relationships between fellows and neighbors. Accountability and discipline are at the core of the program. Each person’s goals -- both professional and personal -- are displayed on a whiteboard in a common area of the laid-back and comfortable space, making it easier for fellows to hold each other accountable. One fellow wants to lose five pounds; another wants to develop a more consistent sleep schedule. To whom are you accountable for making progress on your personal and professional goals? During their nine months with ThinkHouse, fellows adhere to a set of requirements that include participating in all fellowship activities, identifying and hosting one innovator within their field at ThinkHouse, recruiting the next class of fellows, and helping to increase the program’s visibility in the region’s entrepreneurial community through blogs, press interviews, newsletters and social media outreach. Participants also make presentations about their progress throughout the fellowship so others can provide valuable feedback. Their final presentations reveal their growth -- professionally and personally -- over the course of the program. While ThinkHouse alums share many common traits -- ambition, intelligence and drive being key among them -- their ideas are diverse. “We try to bring in people who come from a wide range of backgrounds but share a similar set of aspirations in terms of wanting to create extraordinary impact and extraordinary lives,” said co-founder Gergen, who is also a fellow with Duke University’s Innovation and Entrepreneurship Initiative and the CEO of the consulting firm Forward Impact. Jared Childs learned about ThinkHouse while he was a student at North Carolina State University, just a couple of miles away. The 2015 N.C. State graduate is one of 10 fellows who started this summer as part of the program’s third class. Childs is attempting to change men’s clothes-shopping experience through an endeavor he’s calling Pitch & Primer. He has lofty goals -- a national, and eventually international, men’s accessory, clothing and craft beer retailer aimed at a market he believes is underserved. Childs envisions the business with both a bricks-and-mortar and a virtual presence. “By maximizing the experience and masculinizing shopping, I think I can break into a formerly untapped consumer mindset,” he said. ThinkHouse provides the perfect platform for this budding entrepreneur, who also recently launched The Interbrew, a series of video interviews conducted by Childs and another ThinkHouse fellow, Kyle Sheats, exploring the inspiration, backgrounds and products of local entrepreneurs -- over beer, of course -- to get advice and learn more about what makes entrepreneurs tick. While the project is not yet a money-making enterprise, it’s not uncommon for similar ventures such as podcasts to generate income from sponsorships and affiliate programs -- which Childs hopes to pursue. “What appeals the most to me is the opportunity to live with like-minded individuals, and the unique opportunity to be resourced to succeed and accelerate,” Childs said, adding that the constant access to advice plus the encouragement to step out and try gave him the confidence and skills he needed. Allison Fairbank, one of the off-site ThinkHouse fellows, already had a prototype of Fresh Box, her home food preservation and storage system, but needed help making the leap to an expanded model. ThinkHouse leaders say the biggest challenge so far has been making sure the program meets the needs of its fellows. “Each person has different needs, different target industries. We’re making sure we keep our connections broad and growing,” Quackenbush said. Landing on a learning platform that best fits those needs will be central to future success. Whether that ends up being primarily curriculum- and classroom-based or more heavily focused on inventor networking and support remains to be seen. Currently, the program utilizes both platforms, but for an experimental community built around creating future leaders, adaptive change is always a positive option. What new skills do you need to master to help your institution move forward? Having quickly earned a reputation as a worthwhile and much-needed program, ThinkHouse has been embraced by nearby universities. While many of the fellows come from those schools -- N.C. State, the University of North Carolina at Chapel Hill, Duke -- ThinkHouse has plans to take the model statewide and beyond. Already, companies such as Citrix, which builds mobile workspaces (including GoToMeeting) that enable clients to securely access apps, files and services remotely, have partnered with the program to help further their own accelerator initiatives. Heather McDougall, the wife of ThinkHouse co-founder Jason Widen and founder of the global study-abroad program Leadership exCHANGE, is investigating ways the model can be scaled internationally. Betaversity’s Maroni, who came to ThinkHouse with the twin goals of developing fundamental business-building skills and having opportunities to apply them in real time, is sold on the program. When you are dreaming up new ideas, do you work alone? Who might you bring into the creative process to strengthen ideas, implementation and evaluation? Do you set personal and professional goals? To whom are you accountable for making progress on them? ThinkHouse requires fellows to build networks, recruit new participants and tell the program’s story. Is this kind of outreach an intentional part of your work? Why or why not?